Tracy Martin-Thompson is an accomplished educator who brings more than 20 years of experience in transforming low-performing schools. A native of Cleveland, she began her career in the Cleveland Metropolitan School District, serving as a teacher, principal and area superintendent. In 2006, Tracy was appointed by Mayor Frank G. Jackson to serve on his Cabinet as the Chief of Education. 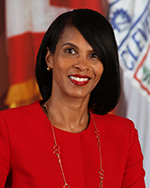 In this position, she acted as an advisor on all education matters impacting the City and the region and served as the liaison between the Cleveland Metropolitan School District and the City of Cleveland. Tracy went on to serve as the Chief of Schools for the District of Columbia Public School system where she implemented initiatives that improved math and reading scores district-wide. Following her tenure with D.C. Public Schools, Tracy worked as the Chief of Staff for Academics for the Detroit Public Schools where she helped to develop and implement a comprehensive five-year action plan, secured over $70 million in School Improvement Grant (SIG) funds, and established a comprehensive plan of support for the district’s lower-performing schools. Tracy also served as the Chief Officer of the Office of Strategic School Support Services (OS4) for the Chicago Public Schools. As the Chief Officer of OS4, Tracy created a new structure designed to provide comprehensive support and services to some of the district’s highest need neighborhood schools, resulting in academic and non-academic improvements. Tracy is a graduate of John Carroll University where she earned a Master of Education in Administration and Supervision. She obtained a Bachelor of Science in Elementary Education from Ohio University.